In the summer I enjoy sitting on our front porch sipping a cool white wine and gazing at the mountains to the south. I find it a very pleasant way to enjoy a week-end day and avoid the sweltering heat. We’ve had a table in this spot since we built the house (years ago — 1976) but the table top (top left background) finally gave way to old age as we all will. I decided to save the table and just build a new top (center in focus). 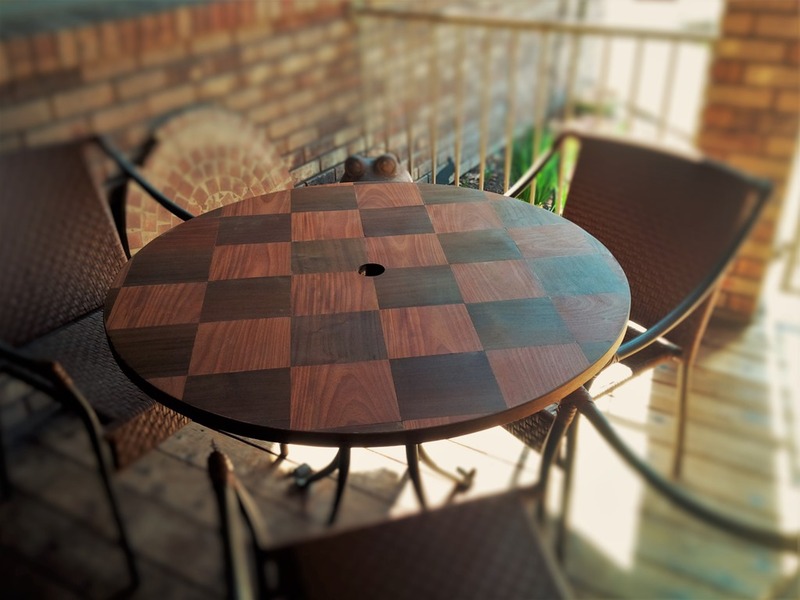 The interesting thing about the new top; I constructed it entirely out of scrap decking material – Epee, a South American Teak substitute that is sustainably produced. I will never use Epee again for a project like this. It is extremely hard (eats saw blades) and hard to work with, its dust is toxic and it weighs a ton. That said, the price was right (cost of a bottle of exterior wood glue). This entry was posted in Barware, Craft Furniture, Epee, Hodgpodge, Whimsy and tagged Contrast, Epee, Light Home Crafts. Bookmark the permalink. It is beautiful, Robert. But the ‘toxic’ part is frightening. Hope you were wearing a mask, at least! Full blown respirator. I don’t mess with toxic dust. Thanks, but like most art, it looks better from a distance. The wood was so hard to work with I had to add at least a dozen “Dutchmen” (patches).